The title of this movie sums up the entire storyline perfectly... The Takers is about a group of criminally minded individuals who take... more particularly steal from others. There is even a tip of the hat tot he excellent Michael Caine movie, the Italian Job in relation to their next job but I'm sure this reference is to the 2003 remake. 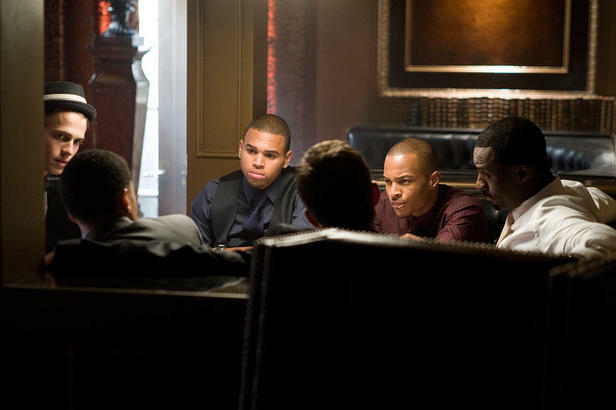 With a colourful cast that include Paul Walker, Idris Elba, Hayden Christensen, Matt Dillon, Michael Ealy, and Chris Brown, The Takers is a movie that many of us have already seen before due to its simplistic premise but fortunately, The Takers doesn't try to be too clever for its own good. In terms of plot, The Takers can easily be summed up in a sentence. Criminals plan "bank" job, something goes awry and then they need to try and fix the problem. It may not be the most original plot in the world but sometimes, a relatively mindless movie like The Takers must be watched every now and then. It's actually a good popcorn movie that you will enjoy in the moment but ultimately forget. I'm not saying that The Takers is a bad movie, it just lacks some originality as the characters plan the heist of the century and when that someone always says that, you automatically raise your eyebrow dubiously. Some of the action scenes, more particularly the car chases are fun to watch with this almost Realty TV series type camera work that makes it feel like you are part of the action. The actors do their best to succeed but some are a little lack lustre in terms of their performance, almost wooden. There are some good performances by Dillon and Tip "T.I." Harris which proves a good contrast to the characters. This Blu-ray version of The Takers looks visually impressive on 1080p with sharp images, vibrant colours and deep blacks. At times, the cinematography has this surreal almost alien type lense to it that highlights some of the images, especially the drama scenes. The attention to detail with the images allows you to see just about every flaw on the actors, when the camera is close-up. It's easy one of the better Blu-ray releases from Sony and there were no errors whatsoever on this review version. Audio supports a 5.1 DTS-HD Master Audio mix that does give your surround sound a work every now and then, once again with the action sequences that boast clear dialogue and decent ambient background sounds. All in all, The Takers is a good looking and sounding movie. For special features, The Takers boasts some commentary by director John Lussenhop, producers Will Packer, producer Jason Geter and Tip "T.I." Harris. It's an interesting insight into the movie from those behind and in front of the camera. There is also a music video from "T.I". Harris called "I'm on T.I. overload now" <insert canned laughter here> and two featurettes on the making of the movie from interviews with cast and crew to the stunts. The Takers may not be everyone's cup of tea but I actually enjoyed this film and even though it will never make my top 50 films, it's like eating a piece of chocolate, enjoyable at the time but ultimately forgettable. The plot has been stolen from all films about heists but the acting, cinematography and Blu-ray format works towards to making this film quite passable. Definitely recommended to those that like their "heist" movies.